The revolutions in wine are not the work of scientists, but of lunatic heroes who try stuff which orthodox thinking says never should be tried. We are as unlikely a team of winegrowers as Mount Salem is a place for growing wine. Largely and proudly self-taught in viticulture and oenology, we are a collection of 2nd Acts, each with decades of experience in other fields and but one passion: great wine. 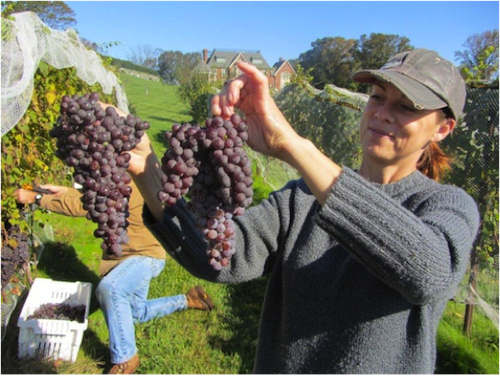 Our vineyard master, Agnieszka, brings the depth, breadth and steadfastness of the European farm girl that she is. Steeped in what some call the “Old Ways” of agriculture, she imbues her oneness with nature, generous spirit, and fierce work ethic with all who know her. Our cellar master, John, joined us after a career on the production side of commercial printing, where he ran large printing presses, from which he developed his eye for detail. He is also a fly fisherman par excellence who runs down the mighty steelhead with the same single-minded focus, and perfectionist bent, as his quest for world class wine. Our winemaker and founder, Peter, conceived Mount Salem with a vision and not much else. Extensive travel domestically and abroad, coupled with living and working in New York and Washington, DC, exposed him to enough wine and winegrowing regions to believe – against the advice of many – that Hunterdon County had world class potential. And with little more than a southwest facing slope and a shovel, he set out in early 2005 to prove what was possible. We are also graced with other people – partners, advisors and volunteers – whose behind-the-scenes work makes the wheels of progress turn. This includes our fiercely loyal community, The Friends of Mount Salem, who since our inception has made growing and enjoying this wine possible.